Búzios sits just to the east of Rio de Janeiro. The peninsula, whose beauty lies in the waters that lap its 26 white sand beaches, used to be a wonderfully sleepy fishing village in the 1960s. Of course, like all hippy hideouts, it's now a slick beachside hang out dotted with gourmet restaurants, upmarket boutiques, and trendy bars. The best places to stay in Búzios vary between tropical hideaways, sleek boutiques and charming little guesthouses. The peninsula is actually split between three separate old towns, which all offer lots of different activities! Be sure to check out the yacht club, it's rather like being in St. Tropez! Stroll through the narrow cobblestone streets shopping for beautiful beach clothes. Head over to Rua das Pedras, where you'll dance until the sun comes up in one of the happening nightclubs. Búzios is known for its wonderful nightlife and Brazilians are a notoriously fun bunch! The 26 pristine white sand beaches offer you snorkelling, diving, sailing, or beach bronzing. If we had to pick one (as hard as that is! ), we'd go for Ferradurinha Beach, tucked away in a little cove and enjoying picturesque surroundings. It's nice and intimate, whilst you can also join in with a number of watersports to keep you entertained. Rocka Beach Lounge will serve you fantastic seafood, and it's an especially wondrous spot at sunset - with gorgeous sea views to be enjoyed as you eat. The ideal place for a romantic dinner. Búzios is rather like the Mediterranean of Brazil, it certainly hasn't lost its languorous Portuguese influence! Discovered by Brigitte Bardot, there's something really special about it. The best places to stay in Buzios are of course pretty upmarket, but you'll find a couple of good cheap guesthouses if you're on more of a budget. Moreover, it is only three hours from Rio, so day trips are also a possibility. Abracadabra - perfect sea views over the bay, rustic chic rooms, lovely pool and sunbathing area. Ideal for a young couple on a budget, really excellent value and also a fantastic fish restaurant. 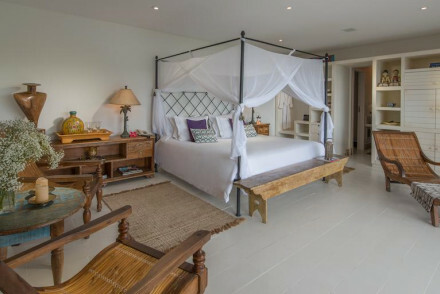 Pousada Casas Brancas - a more luxurious beach boutique offering romantic whitewashed rooms with private balconies and paintings on the walls. Large swimming pool and deck chair area, some two bedroom apartments, and an excellent sea food restaurant. A great choice for families. Insolito - built into the side of the peninsula, this chic boutique spot is tucked away with lots of privacy. The sleek rooms and suites are minimal but still characterful, whilst there's an excellent fusion restaurant and an infinity pool with sea views. Chez Pitu Praia is a stunning boutique spot on Geriba beach. 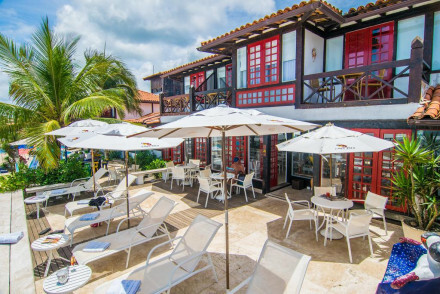 The contemporary accommodation features lovely furnishings and a wide variety of vibrant hues, with some of Brazil's finest surf spots located just around the corner. La Pedrera offers spacious, well-designed accommodation with neutral colour schemes and plenty of wood - whilst some even boast private balconies. Offering family rooms, a lovely spa and with the beach nearby, what's not to love about this spot? Cachoeira Inn - a favourite of Brigitte Bardot, this slightly quirky hotel is situated in a tropical forest. Comprising a wooden structure on stilts which fuses Asian and Brazilian architecture, it also features art from around the world, nine waterfalls and two private beaches. Very romantic! Set in lush tropical gardens just a stone's throw from the beach, Vila D'Este boasts gorgeous Mediterranean-style rooms with splendid views. A supremely romantic stay. If you think a self-catering option would best suit your needs then browse through the wide variety available with our partner, booking.com. In Búzios the sun shines year round and so there's no bad time to visit! It's busiest however in the summer, from December to May, and prices for accommodation will be higher. That said, there's a great party atmosphere if you're looking for a fun-filled holiday! Mid-season, from September to November, is probably the best time come to Búzios if you don't fancy being mobbed by fellow tourists but want decent weather. Tourists can fly into Cabo Frio Airport, 30km outside Búzios. The cheapest way to get from here to the centre of town is to take a taxi into Cabo Frio (costing $11-$14), and then get the B160 bus (costing $2-$3) which takes 45 minutes. Alternatively, an uber will take you just over half an hour and will cost $22-$30. Still not found the right property? Browse all the best places to stay in Búzios. Expand your search to include our recommendations in Rio de Janeiro. Or, contact a friendly guru for advice. A cheap and chic guesthouse on the Buzios peninsula. Perfect sea views over the bay, rustic chic rooms, lovely garden, terraces and pool. An ideal spot for an active beach holiday in a lovely town. 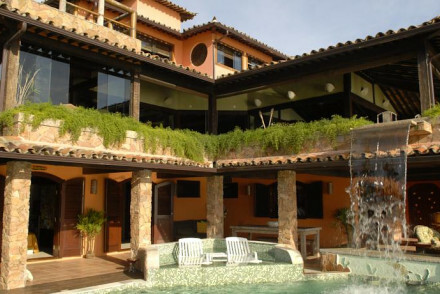 Vila D'Este is a stone's throw away from the beach in beautiful Búzios. It features Mediterranean-style rooms with plenty of wooden features, has lush tropical gardens and the pool offers a great view of the bay. Be sure to enjoy the large breakfast buffet offered each morning. Utterly charming! Private Hot Tub - The master ocean front suite and premium ocean front suite have a private terrace with jacuzzi. Stunning seaside hotel on Geriba beach. The rooms are modern and comfortable, affording great views out to sea. The surrounding area is packed with great beaches and is home to some of Brazil's finest surf spots. Perfect for a relaxing break on the beach. Surfing - The surrounding coastline and beaches are hot spots for surfing. Local markets - Browse the local markets of Geriba. Exuding elegance and simplicity, La Pedrera is a superb seaside hotel. Fitted with delightful rooms, a deluxe spa and excellent local cuisine, it has everything guests need for a relaxing stay. 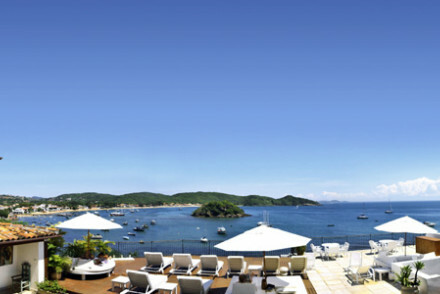 Head down to the nearby beach or explore the fashionable town of Buzios. A seaside gem. Diving - Go to a local dive school in Buzios and take a diving trip. Sights nearby - One mile from the Gran Cine Bardot. 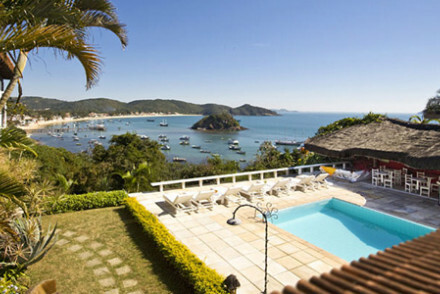 A stunning boutique to the East of Rio, just outside Buzios with 26 beaches to choose from. Romantic rooms, suites, and 2-bedroom apartments have white washed walls, attractive paintings, and private balconies, some with private pools. Fabulous seafood restaurant, large pool, and sprawling terraces. Families - 2 bedroom apartments. 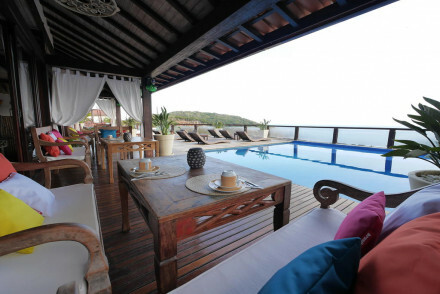 A super chic boutique hotel on east coast of Rio, close to hip Buzios and surrounded by 26 beaches. Luxurious all white rooms and suites with attractive furnishings, some have private hot tubs. An excellent fusion restaurant, infinity pool, and fabulous views from its cliff top position. 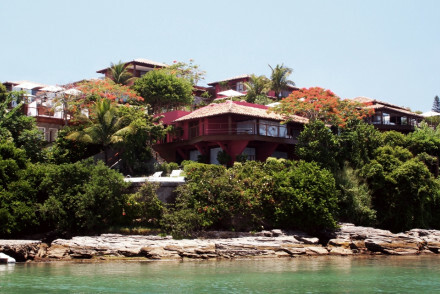 Delightful small hotel in the buzzing resort of Buzios. An intimate adult only guesthouse with cascading waterfalls giving a tropical feel. Colourful suites, some with four poster beds, and all with great sea views from the private balconies. Steps from the beach. A charming lovers hideaway. Romantic Break - An adult only retreat on a private stretch of oceanfront, with outdoor pools, waterfalls and massage treatments. Diving - Dive straight from the hotel rocks. Equipment can be hored at one of the many centres in Búzios.